We're not going to diss roses and we definitely wouldn't be opposed to a ring (hint, hint)... but the thing that often brings us the most joy on Valentine's Day is chocolate. Chocolate in all forms: A heart-shaped box is a classic treat, of course, though we also find ourselves gravitating towards mouthwatering chocolate desserts. Rich, gooey chocolate is the sweet stuff dreams are made of... and it's even better when it has some nutritious attributes. Plot twist: There are actually tons of health benefits to eating dark chocolate, and they can be increased when its combined with other virtuous ingredients such as fruit — which is one of chocolate's most popular pairings. (Strawberries and chocolate, anyone?). Add some nuts or nut butter, coconut or dates and you've got something that will make anyone's tummy feel the love. Okay so sure, chocolate desserts might not be as virtuous as, say, a smoothie — but they beat out any mass-manufactured sweets by a mile. Another bonus? they're something you'll love whether you're shacked up, single, or even staunchly anti-V-Day. 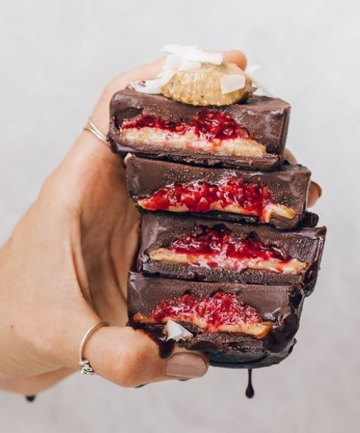 Prepare to drool over the healthy-ish chocolate desserts that will make you fall more in love with chocolate.